The amide bond is the essential structural motif of the protein backbone. The hydrolysis reaction of amides, often used as a model for the cleavage of peptide bonds, is thus of primary concern for living systems. The hydrolysis of non-activated amides is very slow and in most cases undetectable. 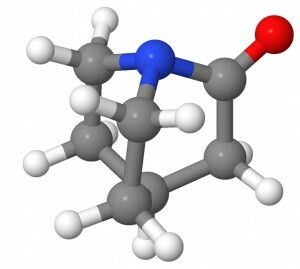 An amide bond’s stability is ascribed to its partial double bond character, caused by the delocalization between the nitrogen lone pair and the π* orbital of CO bond. As a consequence, amides show a characteristic short C-N bond length and a rigid planar conformation. This stability also has important chemical consequences, a low reactivity toward nucleophilic attacks on the carbon and important basicity shifts of the nitrogen with respect to amines. A hypothesis for activation of amides toward hydrolysis establishes that the amide bond could be significantly weakened by twisting the amide bond in the reactant, and thus, imposing orthogonality between the nitrogen lone pair and the carbonyl π-system. This would destabilize the reactant by breaking the nN-π*CO delocalization. The twist of the amide bond could be induced by specific geometrical constraints or by enzyme action on a preferential twisted conformation of the substrate. For example, this type of “ground- state destabilization” has been suggested to be part of the mechanism of catalysis in the case of protein splicing. 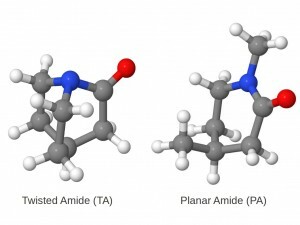 In order to investigate the effect of the amide bond twisting, we studied the hydrolysis of a highly twisted amide (TA in Figure) and its planar counterpart (PA). Our calculations demonstrated that the twisting leads to a substantial rate-accelerations and provided mechanistic details about the reaction.